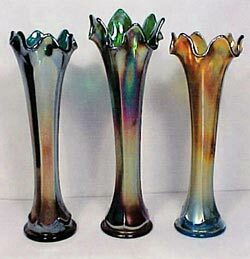 Have you ever thought about how many carnival glass vases have a paneled or flute pattern? Perhaps the different companies could produce the simpler molds easier, with less expense, and therefore be able to market the vases in a faster manner and less cost for the customer. Many of the Flute patterns are difficult to differentiate, but Fenton Flute is a relatively easy one to identify. The six flutes have a definite beginning and end. There is a plain band around the top with the flutes beginning with a rounded top. The easiest and most distinctive way to identify Fenton Flute, though, is a protruding draping double edge ridge near the bottom of the vase. Beneath this draping effect, is a plain area just above the plain marie base. Fenton Fine Rib has a similar protruding end to the ribs, but ends in a single draping edge rather than the double line. As far as I know, the only base size known is 2 1/2”. The vase heights will vary with the amount that they were swung. Ours vary in height from 9 1/4” to 10 1/4”. Others could be taller or shorter than ours. We have three colors, a bluish aqua, green, and an unusual dark teal green. Kevin and April Clark have cobalt,marigold, green, amethyst/purple, red, aqua, and vaseline. David Doty says they’re also available in amber and a pale smokey blue. Edwards and Carwile include white as an additional color. Perhaps there are other colors known. If you have a different color, please contact either Carl Booker or me, so that information can be included in a future issue of The Pump. Your assignment, should you choose to accept it, is to name all the vase patterns that feature either panels or flutes. Perhaps you will think of some that I missed.